Year’s Eve. 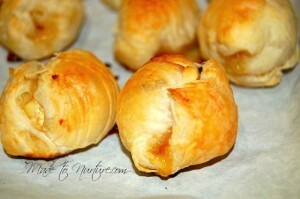 I LOVE Brie and I LOVE Puff pastry, so I thought it would be nice to put the two together in bite-size morsels. Thus the birth of Brie Bliss. Oh my, my… they were delicious. They truly are full of bliss. 2) Lay out a piece of parchment paper. Sprinkle some flour on it and roll out the puff pastry dough until it is about 1/8″ thick. 3) Cut the dough into 2″x 2″ squares. 4) Cut brie cheese into 1″ cubes and place in middle of each square of dough. Spread some jam or jelly on top of the brie. 5) Fold/close the dough around the cheese, so that it looks like a nice little package. 6) Place the parchment paper onto a pan or cookie sheet and place the brie/jam pastry packages about 1″ – 1 1/2 ” apart on top of the parchment. 7) Bake on middle rack for about 15 minutes or until golden brown. Little bites of brie bliss. Lay out a piece of parchment paper. 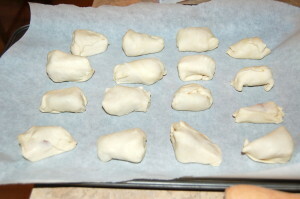 Sprinkle some flour on it and roll out the puff pastry dough until it is about 1/8" thick. Cut the dough into 2"x 2" squares. Cut brie cheese into 1" cubes and place in middle of each square of dough. Spread some jam or jelly on top of the brie. Fold/close the dough around the cheese, so that it looks like a nice little package. Place the parchment paper onto a pan or cookie sheet and place the brie/jam pastry packages about 1" - 1 1/2 " apart on top of the parchment. Bake on middle rack for about 15 minutes or until golden brown. If you want a more savory flavour, instead of using jam or jelly, top brie with minced garlic, diced red pepper and green onion. I can’t say that I have ever had bree before. I ‘m in the mood to try new things so I will keep this one for later. Thanks for the comment, Aimee. You must try brie… it’s so tasty! OMG! Must make this! Pinning now! Thanks 🙂 They are very delish, you won’t be disappointed!